Please find attached mbrview.g4b, a simple grub4dos !BAT script to inspect the contents (partition table) of a MBR. No instructions needed/provided, you either know where your towel is or you don't . to avoid the need to type the extension on command line. for this to work, you should explain what grubutils are required (just wenv?) and where they need to be located - e.g. /boot/grub? Maybe even test for wenv existence at start of script? at the start of the batch file as wenv will then be held in memory instead of loading it from the drive each time. Also, your table border characters only work in non-graphics mode (can't use splashimage and graphicsmode commands or get garbage borders). Note: The default command path for grub4dos is the /boot/grub folder - it is recommended to place all your utilities in /boot/grub on your boot drive so that grub4dos can find them. will run the file menuset which must exist in the /boot/grub folder. The alternative is to path each command - e.g. use /bin/wenv instead of just wenv and place the wenv file at /bin. Sure , next version will also make some coffee (black, strong and with two cups of sugar ). Have you actually TIMED the little batch? It takes next to no time to execute, a faster execution would result in nearer to no time. But thanks for the hint, maybe useful for more complex batch files . Well, that's your problem . Yes, I have timed it - under QEMU it took almost a minute (using QEMU in RMprepusb running from a flash drive)! With insmod wenv at the start it takes less than a second! 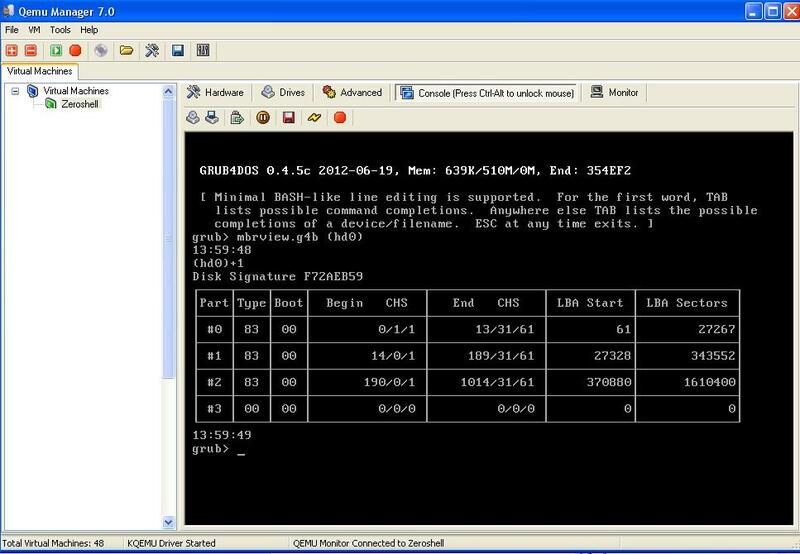 I am using Qemu Manager ("normally" from hard disk). Both mbrview.g4b and wenv are in ROOT of a grub4dos floppy (image) mapped as first floppy (in the QEMU VM, not in grub4dos). at the beginning and end of the batch, in multiple attempts at the most it gives 1 second difference, which means that it takes less than 1 second. This could be a good hint to use a grub4dos floppy image also on real hardware. Is there an "unload" correspondent to INSMOD? It is slow because I boot from a USB drive via QEMU to grub4dos and wenv is on the same usb drive. disk images in QEMU are much faster than external physical device access. I just retested using wenv in the root and it does work without needing the / ! That is odd as I am sure I have tried in other similar circumstances and had to use /wenv ??? So, it seems like it is a good idea to have grub4dos batch files in a grub4dos floppy mapped to --mem, this way everything is fast (and there is not any mess anywhere in the "external" container device, and since we map to "mem" this image can even be gzipped. Seriously , the point/raised issue was only about the opportunity of having an "official" extension for the !BAT files, and thus an easy way to recognize them and having grub4dos treat them as "executables", not necessarily of choosing a suitable extension, we can make a poll for this (after having made a video ). I tried with attached wenv and grub4dos-0.4.5b-2011-04-30 (chenall build) keeping grldr, wenv and mbrview.g4b on the root of the floppy. Firstly, script doesn't run will the following error: "Warning! No such command: setlocal"
Using a 2 yr old grub4dos is not good! Try latest chenall featured build (just overwrite grldr file) - here (2013-03-03 0.4.5c one is latest). The above mentioned one, as well as grub4dos-0.4.5c-2013-03-03, grub4dos-0.4.6a-2013-03-10 returns the following error: "Error 13: Invalid or unsupported executable format"
Try the batch with the LATEST grub4dos version EARLIER than 05 November 2012 (date when the batch was posted). Featured <- this should be last version you can use "normally"
In other words , you should ONLY use "c" versions and ONLY IF the have no tag or they are tagged as "Featured". P.S. only use 'featured' versions = released - others are Beta and experimental - so 03-03 is latest featured. But, really, I don't see a problem in adding a / in front of the command if needed. Holmes.Sherlock, the character you took the nick from was reknown for his deductive, logical capabilities. Please note how this behaviour of grub4dos (different versions behaving differently with regards to files in root) have ALREADY been explicited in this thread. When using an OUTDATED version that DID NOT allow the removing of the slash you get the error, try with a more suitable version! grub4dos-0.4.5c-2012-10-02 fails once again. M y system has turned to G4D repo. Before proceeding further, I'd really like to have a word with chenall regarding how many Renminbi per Beta testing he's going to offer me. It was an OBSERVATION ONLY, my bearded friend, not a bug-report. Before I give several hundred wild tries, I request either of you to try out the same on the latest version. It may happen I am doing some fundamental mistake, though chances are slim. Maybe it's the wenv version the issue? Just to confirm (just tested) that mbrview.g4b works alright with grub4dos-0.4.5c-2013-03-03. Something else must be the issue. Because I used graphicsmode and a bitmap, I did need to type graphicsmode 3 to get nice table lines.